Should the FBI Hire Authors? Imagine this scenario. The FBI needs to safeguard a building for a political debate. They ask you to walk around the inside and outside of the building, then come up with a plan for a terrorist attack. They will pay you good money for this job. Of course you could! Authors are the most creative, imaginative people around! If the FBI needed to uncover police corruption before it happened, let an author write a story that no one thought of before. 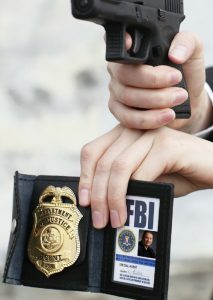 Authors could work for the FBI creating scenarios about civil rights, organized crime, white-collar crimes, violent crimes, and even weapons of mass destruction. An author can think about the world on different levels. This information can then be used to predict crimes BEFORE THEY HAPPEN. It’s like the FBI using a crystal ball! There are other agencies that could use authors as well, such as the military, politicians, local police, and even businesses. An author can come up with a way to sabotage any business in the world. It’s scary, but true. The information could then be used to protect the business. Speaking of businesses, (smart) CEO’s are now hiring authors to write their marketing plans, because authors have amazing creativity and imagination, along with endless amounts of ideas. There’s a reason why authors are important to this world! If you need over 100 ideas to market your book, check out this step-by-step plan made just for authors! Visit 12 Month Author Marketing Plan. Also, you can preview this book by watching the video below!